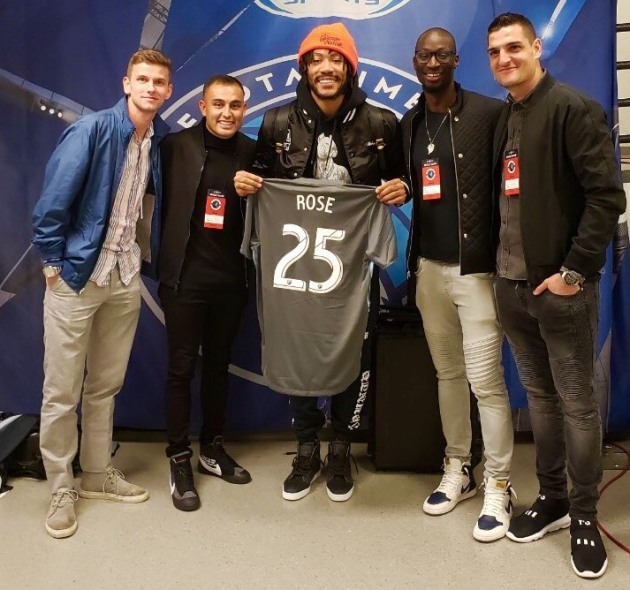 As a lifelong Lakers fan, Minnesota United midfielder and Southern Californian Miguel Ibarra went to the Timberwolves’ Tuesday night game against Golden State and brought along three of his teammates and a gift for Timberwolves guard Derrick Rose. He went to see the NBA champion Warriors on Tuesday and meet one of his favorite players, the Wolves guard and former league MVP. He and teammates Collin Martin, Ike Opara and Vito Mannone visited with Rose and chatted with Golden State coach Steve Kerr afterward as well. Ibarra presented a Loons jersey with Rose’s surname and No. 25 on its back -- the same number as United star Darwin Quintero -- after he and his teammates watched the Warriors win from United managing director Bill McGuire’s floor seats. “I always go to the Lakers’ games here, but the Lakers are terrible this year so I decided to go to the Golden State one,” Ibarra said. Opara and Ibarra returned to training in Blaine Wednesday after both players as well as Mannone, Michael Boxall and Ozzie Alonso either rested or worked on their own on Tuesday, a maintenance day for the regulars while five other Loons are away for national-team duties. All five players given Tuesday as an optional work day returned to training Wednesday for what was a spirited session during a bye week. United next plays March 30 at New England.